For development of a vaccine against Hepatitis B. Sir Kenneth Murray, (1930-2013), was an international leader of scientific innovation who saved countless lives worldwide by developing the first vaccine against viral hepatitis B. One of the earliest workers in genetic engineering, he was co-founder of the first European-based Biotechnology company, Biogen. 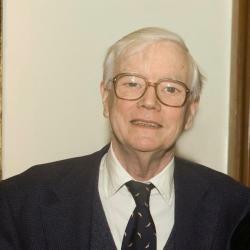 Sir Kenneth obtained a first-class honours degree in chemistry and a PhD in microbiology from the University of Birmingham, where he met his wife, Noreen, who became a close scientific collaborator. Noreen died in 2011. He and his colleagues made the University of Edinburgh a leader in the molecular biology revolution. Sir Kenneth was Head of Molecular Biology from 1976 to 1984, and Biogen Professor of Molecular Biology in 1984.